The world may remember Zambia's President Levy Mwanawasa, who died aged 59 at a Paris hospital on Tuesday, as the African leader who dared to criticise Zimbabwe's President Robert Mugabe. 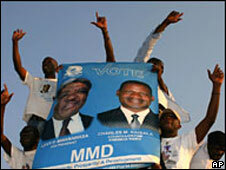 But Zambians will remember him for standing up to his predecessor, Frederick Chiluba. He proved he was no puppet, despite being Mr Chiluba's chosen successor, and within months of taking office in 2002 he had stripped the former president of his immunity from prosecution for corruption. He has also won plaudits from the international community for his fight against corruption and his economic policies. But his local critics accuse him of persecuting his political rivals, using the fig-leaf of corruption, and say he was just fortunate to benefit from a huge rise in the price of copper - Zambia's major export. Critics also say the benefits of the financial windfalls have not reached ordinary people. Some 70% of the population lives on less than $1 a day. The burly looking Lusaka lawyer and committed Christian could, however, point to his reputation for integrity, which he had built up over many years. Many people who worked with him like George Kunda, the former chairman of the lawyers' association, said he did not tolerate injustice in any form and was vehemently opposed to the death penalty. In 1994, he resigned as vice-president, saying his integrity had been "put in doubt", following a row with minister without portfolio and cabinet enforcer Michael Sata, who later challenged him for the presidency. Regionally, he broke with tradition when he spoke out about the crisis in Zimbabwe, once comparing the economic situation there to "a sinking Titanic". Then as chairman of the Southern African Development Community, he said he sympathised with Zimbabwean opposition leader Morgan Tsvangirai when he withdrew from a controversial run-off vote in June because of attacks on his supporters. He suffered a stroke in Egypt on Sunday hours ahead of the opening of an African Union summit where Zimbabwe's election was to be addressed - and where he was expected to sit next to Mr Mugabe. Questions about Mr Mwanawasa's health dominated his presidency. In the early 1990s he was involved in a near-fatal road accident and was hospitalised in South Africa for almost a year. Ever since his speech was slurred - something that may have hindered his popularity in the political arena where he was not noted for his charisma. He was first sworn in as president amid opposition protests over alleged fraud in the 2001 elections, but he convincingly won his second term four months after suffering a minor stroke. Although Mr Mwanawasa belonged to a small ethnic group called the Lenje, in central Zambia, he was born and brought up in the Copperbelt province. In 1970, he entered the law school at the University of Zambia, from where he graduated with a Bachelor of Law degree in 1973. He had numerous professional distinctions, among them becoming the first Zambian lawyer to be appointed advocate and solicitor of the Supreme Court of England and Wales. In Zambia, he was famous for taking up cases that few lawyers would even contemplate. But the one case that pushed him into prominence was a treason case in 1989. He had to defend former vice-president Lt Gen Christon Tembo and others who were charged with plotting to overthrow the government of the then president, Kenneth Kaunda. Mr Mwanawasa was married to a fellow lawyer Maureen. He had six children. As befitted his reputation for probity, he was said to be a man of modest habits.